The go-kart racing season is in full swing, and for SeCo Racing of Benton, Ill., Kohler's C6 XKE engine has definitely put this team on the fast track for 1999. The SeCo race team, brothers Sean Vardell (age 13) and Corey Vardell (age 10), are not only learning and enjoying their inaugural years in racing -- their winning! Competing in the Kohler Rookie Class at The Speedrome in Anna, Ill., SeCo Racing won early and often this season and has positioned itself for a very promising future. Following in the footsteps of their father, Steve Vardell, both Sean and Corey have dreams of making racing their life-long careers. "I have always wanted to race cars ever since I can remember watching my dad race," said Sean. "If things go right, I plan on racing in the ASA, ARCA or Busch (Grand National) Series when I turn 16, and Winston Cup at 18." Both Sean and Corey won races their very first day of competition. Corey won both heats while Sean took the checkered flag in the feature, and their success has continued to grow. Sean and Corey are a team and, although both enjoy the competition with each other, when the racing is over for the day, they are back to just being brothers. Steve believes that racing go-karts will give Sean and Corey the learning experience they will need if they ever compete on the professional level. The SeCo racing team is powered by Kohler's C6 XKE engines, and the engine has received rave reviews from Steve, who publishes Race Review, a national publication that covers all facets of racing, from go-karts to NASCAR. In fact, Steve became so enamored with Kohler's new C6 XKE engine after attending a karting trade show last fall that he contacted the company about obtaining a couple models for testing. His passion for the engine has grown to the point where Steve has become an authorized Kohler dealer for the C6 XKE engine. "This Kohler engine is what all kids need," said Vardell. "The engines come ready to race right out of its box. Young kids should be learning about the fundamentals of racing, not spending all their time changing the oil and working on engines and carburetors." The Kohler Rookie Class gives kids the opportunity to hone their setup and driving skills, not breaking the bank trying to be competitive. Kohler's C6 XKE Series engines make go-kart racing for families quite affordable. They are race ready, no blueprinting or modifications are necessary. They are high performance engines that run on gasoline, meaning, no high-maintenance methanol fuels are required. 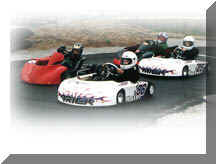 "Go-kart racing for kids should be fun as well as a learning experience," said Vardell. "My goal is to give Sean and Corey all the necessary tools to achieve this. The Kohler Rookie Class and the C6 XKE engine is an economical way for more families who want to race the ability to do so."